The day when her father suddenly has to go to hospital leaves Mini with a whole bunch of problems. Not only does somebody have to step in for her father when it comes to leading their Chinese restaurant. Mini must also attend to her uncle Wu who has come to visit them for a couple of days. Her normal life in Germany seems to be totally strange for him, and so he calls everything into question with his incessantly patronizing manner. All of a sudden Mini – whose real name is Minh Thi – sees herself confronted with her family’s complicated past, beginning with their journey from somewhere in Vietnam and Thailand and ending here in the restaurant with the vials of sour sweet sauce and a white bearded porcelain figurine. The author: Que Du Luu was born in 1973 in Vietnam, but grew up in Herford, Germany, and now lives in Bielefeld. She studied German studies and philosophy and today works as a freelance writer. 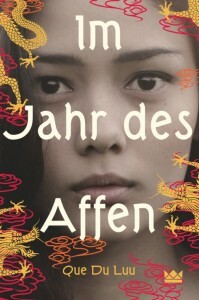 Que Du Luu has recieved a number of awards, the latest being the Hohenemser Literaturpreis for her short story »Das Fest des ersten Morgens« in 2015.